So who is super excited today? Yep, this girl, why you ask? This is my very first blog hop. 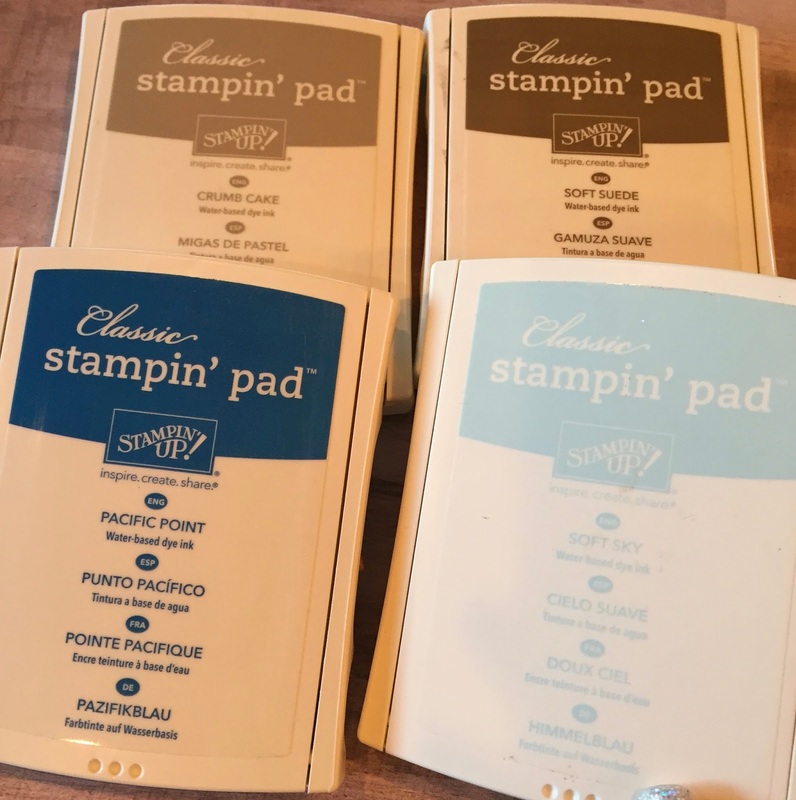 I have been challenged by a great friend and fellow Stampin' Up! demonstrator (Thanks Diana!) into stretching myself, and going outside my comfort zone. And writing is defiantly outside my comfort zone. Ever since a English teacher made me cry, a long, long, long time ago, I have been convinced that I can't write. 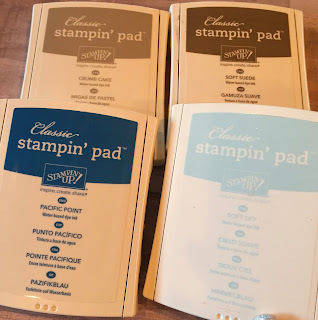 This blog hop is all about small stamps. You know the ones, the tiny ones that sit in their case and rarely get used. Where you look at them and think what am I supposed to do with these. Well let us show you! Let's start with this great stamp set, Swirly Bird and I'm going to use this one tiny stamp in it. I needed a masculine card, who doesn't need a guy card every once in a while? So I pulled out Soft Sky, Crumb Cake and Soft Suede and randomly stamped on my piece of Very Vanilla card stock. 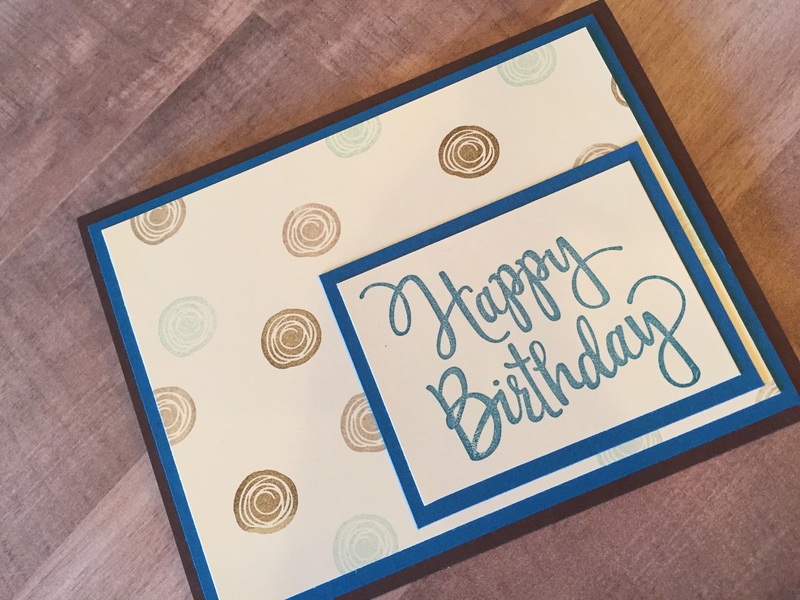 Then I stamped Happy Birthday in Pacific Point, using the Stylized Birthday stamp. 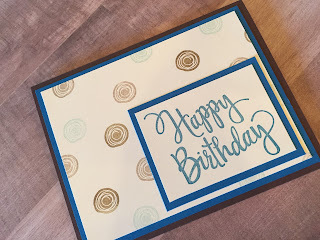 Stylized Birthday is not a small stamp but it's probably one of my favorite stamps in the catalog. 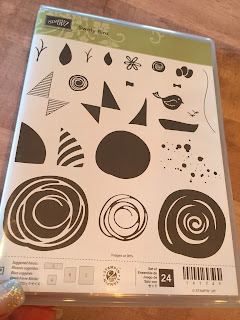 So, hope you enjoyed my take on small stamps and making your own pattern paper. WOW, that was defiantly less painful then Yoga. 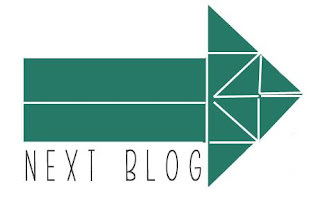 Thanks so much for visiting my blog and don't forget to leave a comment and let me know what you think. 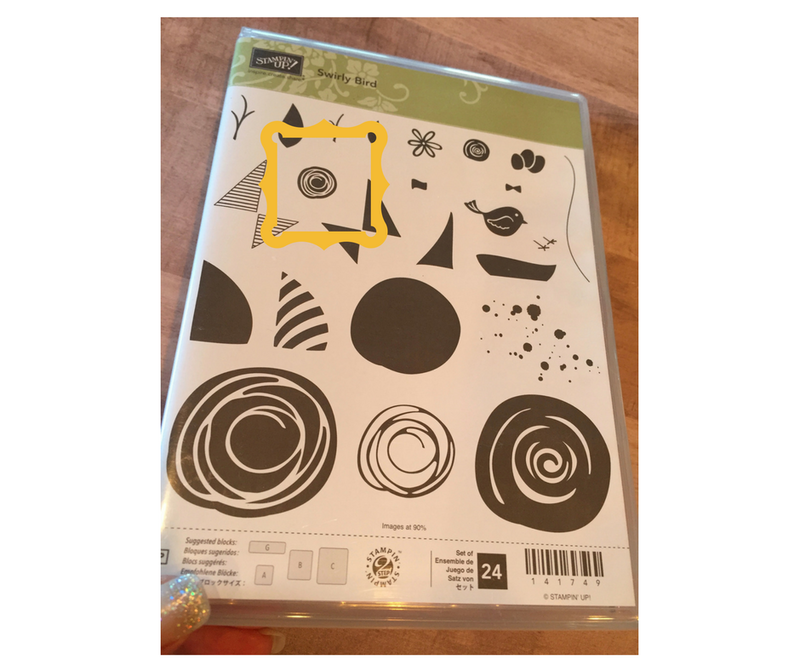 Click the arrow to visit Susan Wong and see what awesome project she came up with! You totally rocked your first blog hop Jennifer!! So excited to have you on board - a very warm welcome to the group! Love this handstamped background you've created. Thank you so much for sharing! Congrats on your first blog hop Jennifer. So glad you could join us. Love the card too. what a great first post! I love your card, nice blue-brown combo. 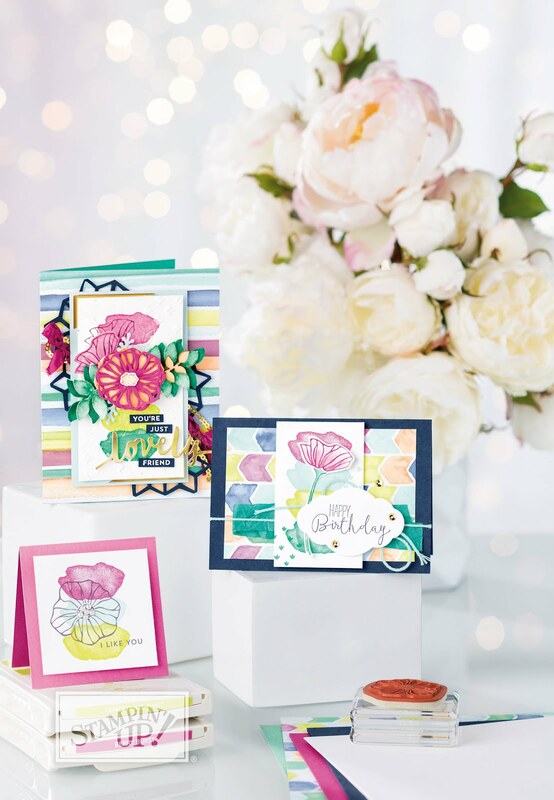 Great masculine card Jennifer, and you have done a fantastic job on your first (of many, I hope) blog hops. Great post for your first hop. Lovely card. Woo hoo!! I am so excited for you participating in your first blog hop! 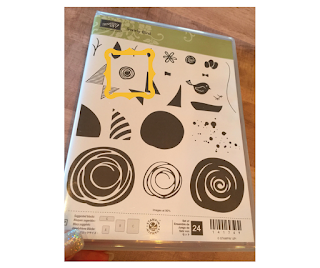 And you know I love that card - quick and easy! And yes... this is definitely easier than yoga. LOL! I would never have thought of using that stamp for a male card - genius!